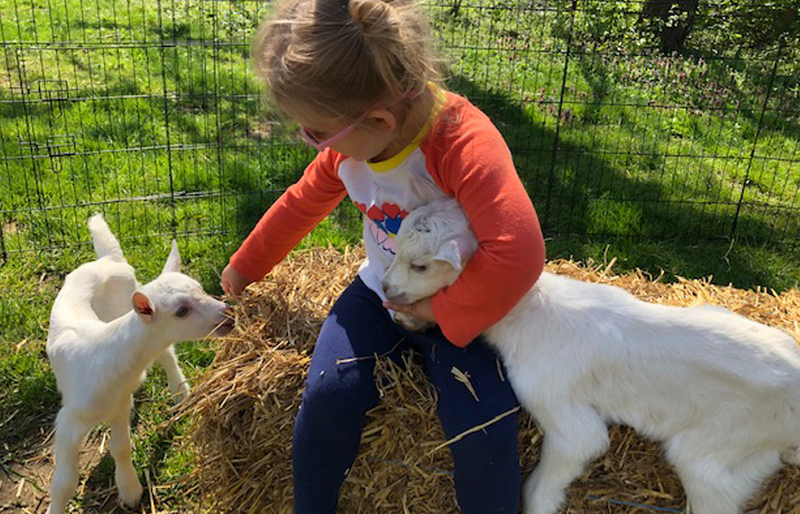 Baby goats are called kids, and your family can get up close and personal with them on select dates this month at Noble Springs Dairy Farm. 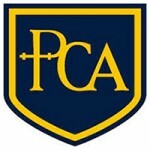 WHEN: Fridays, April 12 & 26 from 1 - 3:30 p.m.; Saturday, April 13 from 10 a.m. - 1 p.m.; Saturday, April 27 from 10 a.m. - 3:30 p.m. 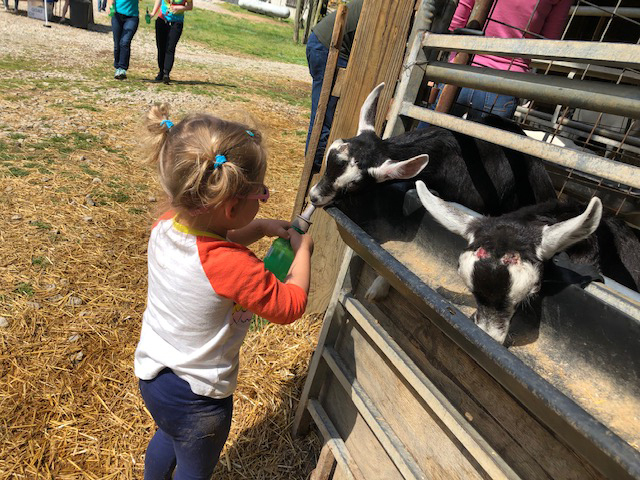 The city of Nashville has a world to offer our kids, but if you're looking for an adventure outside city limits, then pack up the car and head on out to Noble Springs Dairy Farm. This family-owned and operated farm is located in Franklin about 40 minutes from downtown Nashville. Although the farm has events throughout the year, 'kid cuddling' (and by 'kid,' that means baby goat, not a human kiddo!) has become a popular annual event for the farm. Knowing how much my 2-year-old loves animals, we had to 'hoof it' out there! The drive out to Noble Springs was an unexpected part of the day's magic. As the city streets transform into rolling hills and farmland, we began to truly feel spring's arrival. The fact that parking at the farm is effortless further adds to the magic for this mom. As kid cuddling was a process unfamiliar to us, the friendly staff chatted us through a process that is very short and sweet. Our cuddling was a dynamic and interactive engagement with baby goats in which we cuddled, played and bottle fed the little ones. Sadie gets acquainted with the baby goats at Noble Springs Dairy Farm. The goats are divided into large corrals. 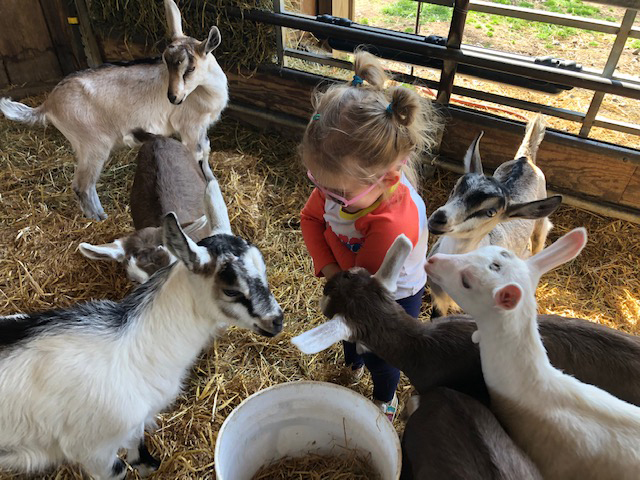 Depending on you and your child's comfort level, you can interact outside the gates or get right in the mix with the goats by entering the corrals. If your children are anything like mine, I would dress for mess in clothes that you're fine with getting dirty; your children will likely be covered in hay, mud and goat hair by the time cuddling is through. Sadie, my 2-year-old, loved the ability to cuddle, feed and play with the goats as if she were on a play date with a friend. If a member of your group or family is a little intimidated, there is a small pen set up with two baby goats that are just one week old. Their sweet size and age is less overwhelming for more timid little ones. Sadie has fun bottle feeding one of the kids at Noble Springs Dairy Farm. YOU CAN TOUR THE FARM, TOO! Beyond kid cuddling, the farm is open for walking tours that last about an hour. The farm tour is not stroller friendly, but it provides a great opportunity for older kids to walk and get some exercise. On the tour, you will learn about the farm and see its cows, chickens, horses and pigs while getting a little education about how the dairy farm makes it products. You can even leave with a yummy souvenirs like cheese, milk and fudge. My toddler didn't have the attention span necessary for the tour, but her city-slicker mama learned so much about where our food comes from. The farm's dining options are limited, so I recommend bringing snacks or planning a lunch stop on the way home after your farm visit. Our trip to Noble Springs Dairy Farm was truly a welcome change of spring scenery for my family. Not only did I get to show my toddler a nearby world outside of our own, we got to support a local farmer as well. We look forward to making kid cuddling a yearly spring tradition for our family. Samantha Fernandez is a local mom who loves going on outings with her daughter, Sadie.